"It's little wonder that people are confused about where to go and what to do when they get ill. I personally hear all about this, because I mentor hundreds of men and women throughout the world. They become overwhelmed by the media propaganda and aggressive advertisements they see on television. 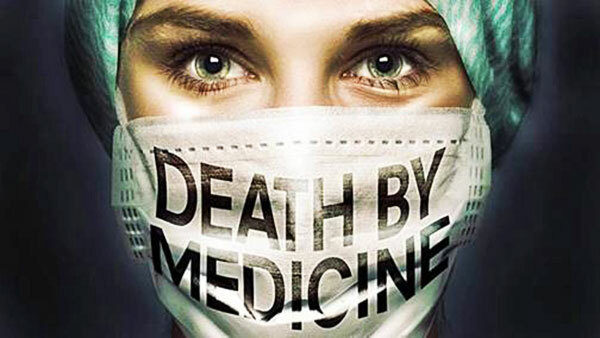 Our medical industrial complex has turned into a bizarre conglomeration of misinformation, lies and deceptions designed to further the corporate agendas of Big Pharma, government regulatory bodies and mainstream medicine, with little regard for human wellbeing." Where did all the madness (pharmaceutical terrorism) come from. "Bayer-Monsanto, soon to be just Bayer, which owns 60% of proprietary seeds and 70% of agrochemicals in the world. There are a lot of industries that wreck havoc on our world. One just has to think of the biggest global banks and oil companies. Think plastics and now think of telecommunication companies that are lusting to bombard us with even more microwave frequencies via their rollout of G5. But there is one field that is much worse than all others: agro-chemicals. At some point, not that long ago, the largest chemical producers, who until then had kept themselves busy producing Agent Orange, nerve agents and chemicals used in concentration camp showers, got the idea to use their products in food production," writes the Automictic Earth. Everywhere we go in modern medicine there are dangers that can ruin your life. Even safe procedures are dangerous. "When a doctor orders an MRI, it's usually is to help detect or rule out something potentially life-threatening, or at the very least, something that could make you seriously ill. But, it's recently come to light that this rather routine diagnostic test, meant to help you, can have devastating effects on your health." It is not the frequencies MRI employs, it is the contrast agent that they often use. Gadolinium is a metallic element with magnetic properties. It is injected into about one third of patients getting an MRI, in order to enhance imaging. If your doctor has ever ordered an MRI with "contrast" for you, you were exposed to gadolinium. But most likely you had no idea you were being injected with a known neurotoxin, capable of inhibiting mitochondrial function (energy production) and causing oxidative stress. Bayer experimental drugs were tested on Auschwitz prisoners. One of the SS doctors at Auschwitz, Dr. Helmut Vetter, a long-time Bayer employee, was involved in the testing of Bayer experimental vaccines and medicines on inmates. He was later executed for giving inmates fatal injections. "I have thrown myself into my work wholeheartedly," he wrote to his bosses at Bayer headquarters. "Especially as I have the opportunity to test our new preparations. I feel like I am in paradise." "there was created the largest and most powerful cartel the world has ever known. Not only has that cartel survived through the years, it has grown and prospered." Heroin, originally created by I.G. Farben, was outlawed in 1924 as a prescription drug in the United States. Most people are living in a bubble of idiotic self deceit, out or touch with reality, dumbed down, immune to deep feelings, immune to caring and concern for the reality we are all facing. Evil has prevailed despite the best intentions of all the good people on earth. "More and more, I hear that folks are feeling frustrated and betrayed, combined with a sense of loss and despair. I feel this way, too. As I've written recently, I observe this is due more than anything else to a widespread demoralization society is suffering from. Certainly, the statistics reflect this. Suicides in the US are up 30% since the turn of the millennium, obesity is at epidemic proportions, mortality rates are rising especially among white working-class Americans, and our national opioid addiction is now the "epidemic of epidemics." When an organism gives up on self-care, breeding, or its will to live, it's suffering from a tremendous amount of strain that is cutting it off from its own life force. A dispirited lion wasting away in a cage has a lot in common with the average American today." "At a deep level, what ails us is not a host of unrelated, intractable problems, but the fact that our model of pursuing eternal economic growth simply isn't working anymore. It doesn't work for the planet's increasingly strained ecosystems, nor does it work for the bottom 99% of folks in society (i.e., the non-elites). The various health epidemics noted above are merely symptoms of a larger acute spiritual crisis." Years ago, the H1N1 vaccine was linked to 700 percent increase in miscarriages but the government does not care about this form of terrorism because they are terrorists at heart at the CDC and the FDA. A shocking report from the National Coalition of Organized Women (NCOW) presented data from two different sources demonstrating that the 2009/10 H1N1 vaccines contributed to an estimated 1,588 miscarriages and stillbirths. A corrected estimate may be as high as 3,587 cases. NCOW also highlights the disturbing fact that the CDC failed to inform their vaccine providers of the incoming data of the reports of suspected H1N1 vaccine-related fetal demise. We could go on all day with one dastardly report after another. Modern medicine in the United States today is putting people in their graves in large numbers but before it does the system is increasingly beating them into bankruptcy. Purdue Pharma, the company that planted the seeds of the opioid epidemic through its aggressive marketing of OxyContin, has long claimed it was unaware of the powerful opioid painkiller's growing abuse until years after it went on the market. But a copy of a confidential Justice Department report shows that federal prosecutors investigating the company found that Purdue Pharma knew about "significant" abuse of OxyContin in the first years after the drug's introduction in 1996 and concealed that information. In 2016, one in 65 deaths in the United States involved opioids - and among younger adults, that number skyrocketed to one in five, according to a new study. The Nuremberg War Criminal Tribunal convicted 24 IG Farben board members and executives on the basis of mass murder, slavery and other crimes against humanity. Amazingly however, by 1951 all of them had already been released, continuing to consult with German corporations. Today each of the three daughters of IG Farben is 20 times as big as the IG Farben mother was at its height in 1944, the last year of the Second World War. And we still wonder why modern medicine is a killing machine. The FDA's huge power to do wrong is founded in their ability to lie and deceive the public by declaring harmful toxic substances safe. The Food and Drug Administration (FDA) practices a unique form of terrorism that tends to be particularly ugly, mean, nasty, brutal and cruel. They are an organization from its inception dedicated to the slow poisoning of every man woman and child in America. There are people on this planet that take pleasure in hurting other people, others just cannot help it and they hurt from sheer psychological habit. The general nature of ‘evil' is to not have consciousness of the effect that our actions have on the feelings and emotional world of others. Doctors have no excuse for how many people they kill each year, at least in America - where such statistics are kept and published. If we were really interested in eliminating terrorism in the world we would start with the terrorism against children. The horrors of the childhood vaccine program are too long to tell but billions get paid out in the United States alone for vaccine damages and vaccine death. You do not hear that in the papers so understand how deep the rabbit hole of terrorism goes. The world is going down, civilization is threatened by Mother Nature and by ourselves from a host of sources because of our ignorance of terrorism in ALL its forms. As a race we are less intelligent because of our blindness of how terrorism operates on every level of human activity. Our collective blindness has created a dark side that is conspiring to take us down into a human pit of suffering. That doctors and the medical industrial complex has embraced this darkness is telling.